I found two providers, the original Round Flash (close to 100 € / $) or a low-cost version from Neewer for one-third of the price. Read my review after the jump. After it arrived I summoned my son for a first test. 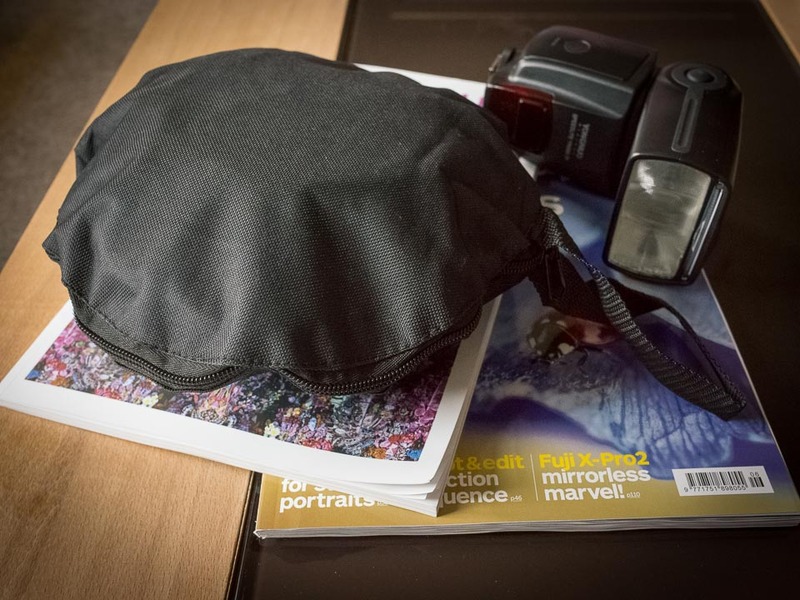 I was surprised how small the little bag with the collapsed ring light is despite its size of 45cm diameter when expanded (the inner diameter is 13cm). Setting it up takes no more than 30 seconds. You just twist it open and expand it by connecting the skeleton sticks with their magnetic iron tips. On the top it has a hole to stick the head of the speedlight through with an adjustable velcro strap to fix it to any speedlight unit. 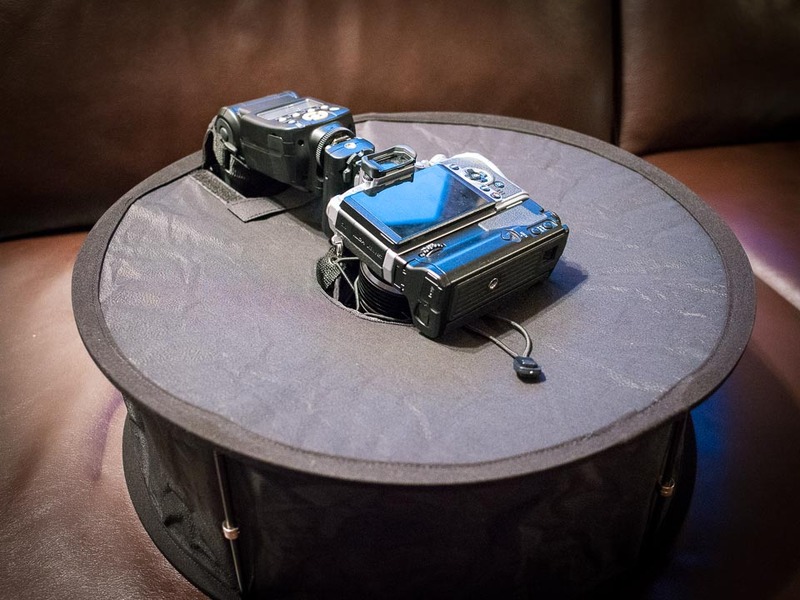 The inner ring of the donut shaped softbox has a speed lock elastic web that should tighten around any diameter lens. I tested it with my mZuiko 12-40mm f/2.8 Pro Zoom as well with the mZuiko 75mm f/1.8. Both attached nicely and there was absolutely no vignetting from the softbox frame visible in the pictures. The material is solidly built and has no noticeable odor to it (which you sometimes get with budget China ware). The Neewer 18” Ring Flash Diffuser is essentially a big round softbox light modifier for a hotshoe attached flash unit for shooting portraits with even and smooth light, as it completely surrounds the lens and produces virtually shadow free images of the face of the subject. Additionally it adds beautiful round catch lights into the eyes of the model. Although my initial test was with a portrait shoot it should be just as well be useful for product photography. Mounting the softbox to the front lens and flash provides an easy to use ring flash, with no need for extra cable, bracket or power supply. Due to its size it is easy transportable and can be used at home, in a studio or on location. This is the view from the back with camera and flash attached. As you can see the Olympus OM-D E-M1 with the Yongnuo Speedlite YN560 IV Flash that sits on top of a Yongnuo RF603C II Trigger (for triggering a second flash that white outed the backdrop for the high key effect in the example portrait) fits perfectly. Despite the bulky size when expanded and with the camera attached the handling is quite acceptable. In pictures on the web you often find the setup sitting on a tripod, but I found handholding the camera with the ring light attached is absolutely no problem, the diffuser sits tight on lens and flash and you just need to focus through the viewfinder / LCD display of the camera. The only drawbacks are that turning the lens to zoom through the front opening is a bit awkward (but can be done without problem) and that you have to talk to your subject from behind the ring light, but this also should be no big problem. Loss of light through the diffuser is acceptable, I found it “eats up” about a half stop to a stop. As this kind of setup is more for close up work it shouldn’t be a big issue with most cams. The example shots were taken at 1/250 sec at f/5.6 and ISO 200. I didn’t notice any hotspots, the light spreads evenly throughout the softbox. 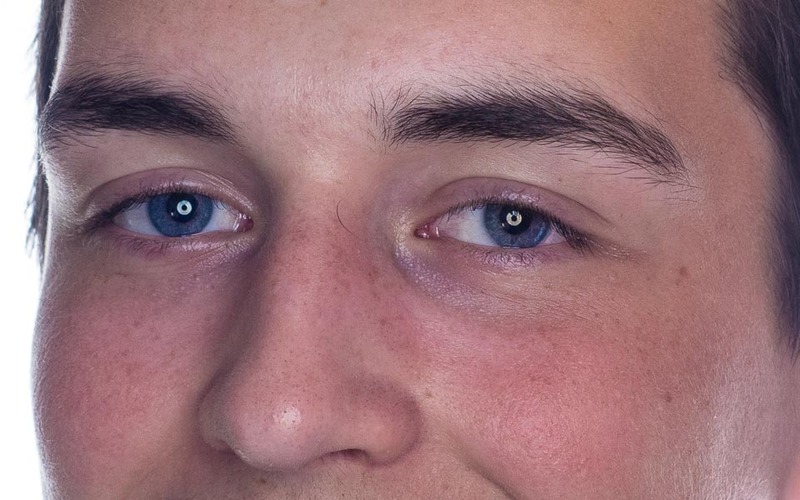 As you can see from this close up, besides an even lighting of the face the Neewer 18” Ring Flash Diffuser also provides very nice catch lights in the eyes for punchy portraits. And this was really was I was looking for. For properly folding the Ring Flash you need to just twist it. I had some difficulties early on but a quick search on YouTube provided a 60 seconds video how to do it properly. With that help its a breeze. As you can see the little pouch fits easily in any bag if you want to take it on location. 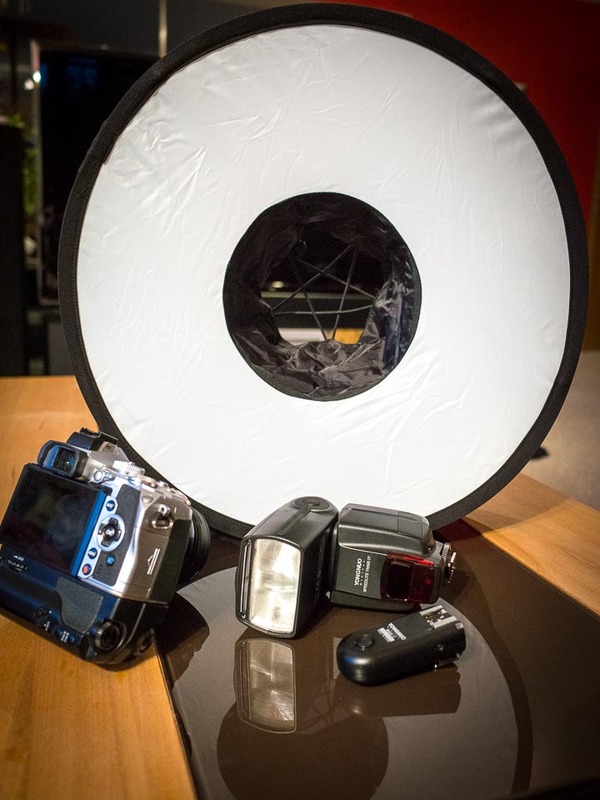 All in all this is a perfect light modifier on a budget. I can’t see where the “Original” Round Flash that costs three times as much would provide better build or handling. I’m really happy with it and my initial results and recommend it highly! And below is the link to the Flash Ring on Amazon.com. As I’m not an affiliate of Amazon nor I’m sponsored by anyone this is just for your personal reference. The price is 27,50 $ or 27,50 €.